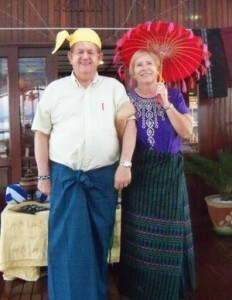 Myanmar (formally Burma) has become more available to tourists in the last several years. My wife, Susan and I were intrigued by what we had read about this country. 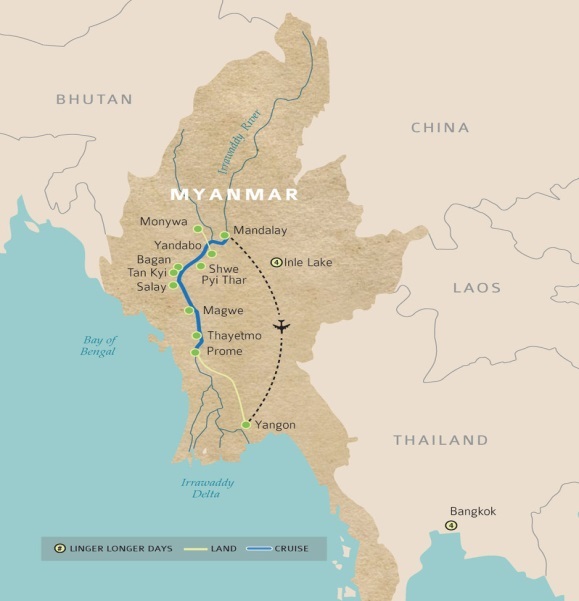 The main river is the Ayeyarwady (Irrawaddy). Its source is in the Himalaya glaciers going south to the Andaman Sea, a distance of 1,348 miles. 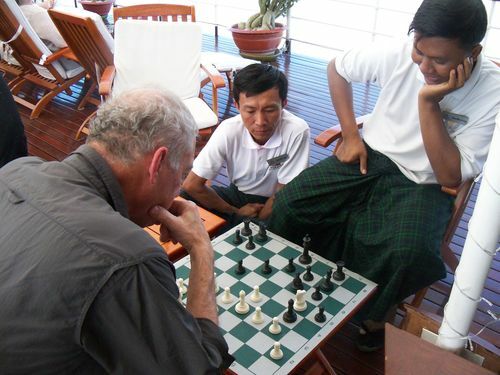 Although we traveled on the Viking Mandalay riverboat from Mandalay to Yangon, the trip was long enough for me to meet the people of this diverse country and play a few games of chess. We saw hundreds of Buddhist temples and stupas, visited monasteries, schools, an orphanage, went shopping in the produce market, wore local clothing, learned a native dance, enjoyed a life-sized elephant puppet dance, and bought some souvenirs and gifts. My first chess encounter was with a fellow passenger, Gary Nichols, originally from Brooklyn, NY, who now resides in Charlotte, North Carolina. 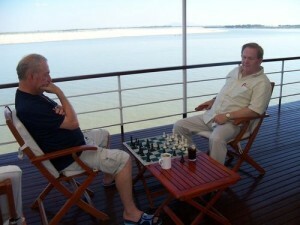 He approached me after I set up my board and pieces on the Sundeck and asked if I was the “chess guy”. I confirmed that I played, and he replied that he had a problem. He said, “I have played my son many times, and I just can’t beat him. Could you help me improve my game?” I told him that I would be happy to help out and that we could play a game so I could see how well he played. Our first game showed the normal weaknesses of a casual player. He did not develop his pieces nor attempt to control the center and delayed many moves before castling. We worked on these ideas as well as discussing pins, forks and skewers. I had an extra folding magnetic set which I gave one to Gary so he could play his son when he got home. Gary was a quick learner and was able to integrate these ideas. I shared an idea with him that I learned from GM Isaac Kashdan. When I was at a scholastic event in Los Angeles, he was the honorary tournament director. I approached him to ask for some advice that I could share with my students in the school chess club that I sponsored. He said, “Learn to count in the endgame.” At first I did not understand what he meant because it seemed too simple. After more endgame study, I realized what GM Kashdan meant: Count the number of moves before making a plan. A good start at endgame strategy would be the ten principals found at this site: http://www.chessfornovices.com/chessendgamestrategy-top10principles.html. My next opponent was H-tike H-tike, a young man who was working on board the ship as a bartender. He stopped by and asked if I would like a game. I was certainly happy to oblige and we had several games. He always had a smile on his face and was eager to play. 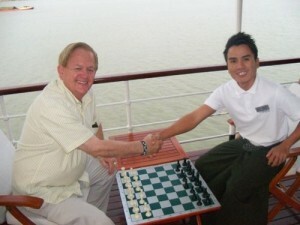 His friend, Soe Moe Aung showed up a day later to play. 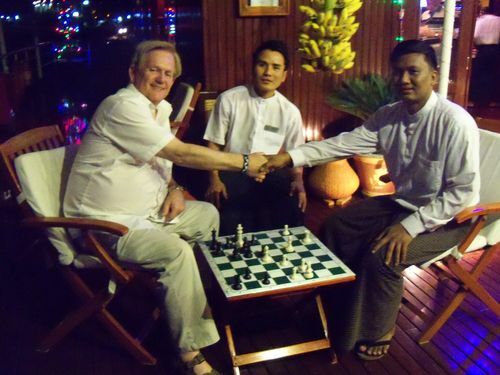 I now had two locals and a North Carolina guy as chess opponents. Soe was a very serious student of the game. He took his time and gave me the greatest challenge of the cruise. I gave him a folding magnetic like the one I gave Gary and declared him the unofficial champion of the Viking Mandalay riverboat. 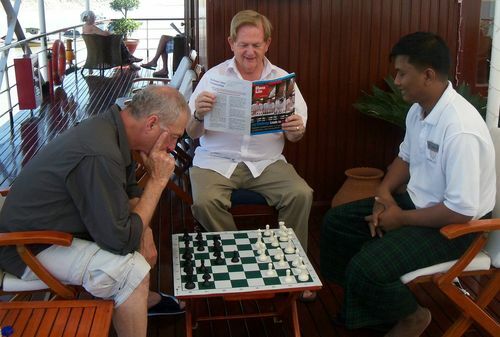 I also left the chess board and pieces you see in the pictures on board the ship. I hope other passengers will enjoy a game or two. The position on the board you see above was one I have never had before. I forced his king into my castled kingside and mated with a knight. Sometimes you have to surround your opponent. Lots of action took place as you can see below. In the picture below, Gary had a second game with Soe and things were going along nicely when another member of the crew showed up and began watching the game. I suspect the word got around the ship about the chess games. The only problem was that the other member of the crew started to suggest moves to Soe during the game. After a few moves and finger pointing by our kibitzer, Gary turned to me and asked, “Can he interrupt the game like that?” I shared with Gary that it was not uncommon in recreational chess games for outsiders to make suggestions. After a few moments, Soe told his friend that he should not help. This was an amazing riverboat cruise, which was made even better by all the chess games that I enjoyed playing and watching.